Scientists have been investigating the role of iron in stimulating the growth of plant plankton in parts of the ocean where nutrients are high but plankton growth is limited. In 2004 an international team of scientists set out in the research vessel Tangaroa and spread iron sulphate over 50 square kilometres of ocean to the south-east of New Zealand. They were trying to gauge plankton growth from changes in atmospheric gases above the treated water. 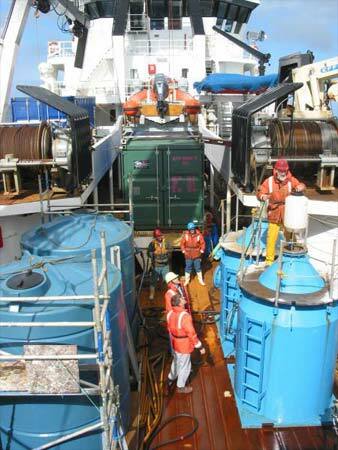 Here, scientists check tanks holding the iron sulphate and tracer gases. The following account of the research comes from a University of Otago press release, dated 19 March 2004. Scientists have spread several tonnes of iron sulphate into the southern oceans between New Zealand and Antarctica in a series of experiments that investigate the role of iron in controlling phytoplankton growth. Iron, necessary for all living things, is in short supply in parts of the sea. Allied to these investigations was a wider question about the relationship between plankton and global warming – scientists believe that global warming is caused by increasing levels of carbon dioxide in the atmosphere. Phytoplankton remove carbon dioxide during photosynthesis and manufacture organic material from the carbon. Some scientists have suggested that adding iron to the world’s oceans could help control atmospheric levels of carbon dioxide. Oceanographer Philip Boyd from the University of Otago directed the Southern Ocean Iron Release Experiment (SOIREE) in 2000, which found a significant increase in phytoplankton growth up to 13 days after adding iron sulphate solution to the ocean. However, it was not clear whether the increased plankton growth had any effect on carbon dioxide levels in the atmosphere. To be effective, dead phytoplankton need to sink to the deep ocean where their carbon stays isolated from surface nutrient cycles for centuries. If phytoplankton are eaten by zooplankton or digested by bacteria while still in surface waters, carbon dioxide is released back into the atmosphere. A 2002 southern ocean experiment indicated that only a small fraction of the carbon taken up by phytoplankton reached the deep ocean. Following experiments in Alaskan waters in 2003, Philip Boyd concluded that fertilising oceans with iron is unlikely to be a solution to global warming.